My Malaysia Airlines flight to Tokyo Narita was departing at 9:40AM, though I ended up heading to the lounge around 3AM. 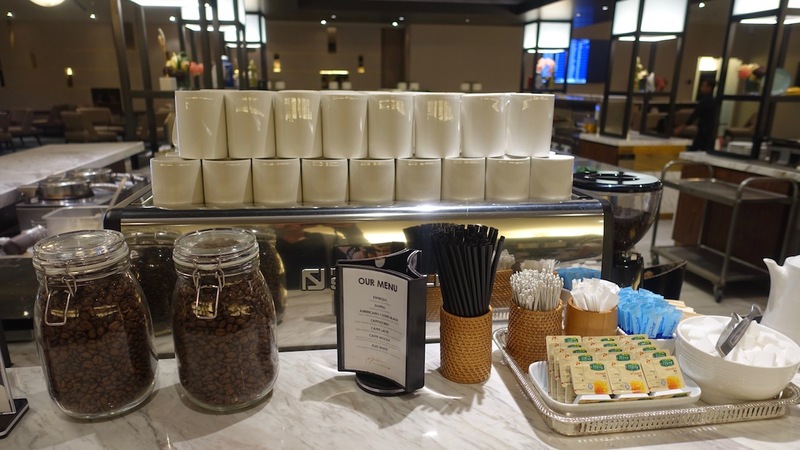 That’s because I was staying at the Sama-Sama Express Hotel located within the terminal, and when I woke up in the middle of the night and couldn’t sleep, I figured I might as well go somewhere where I could get a cup of coffee. 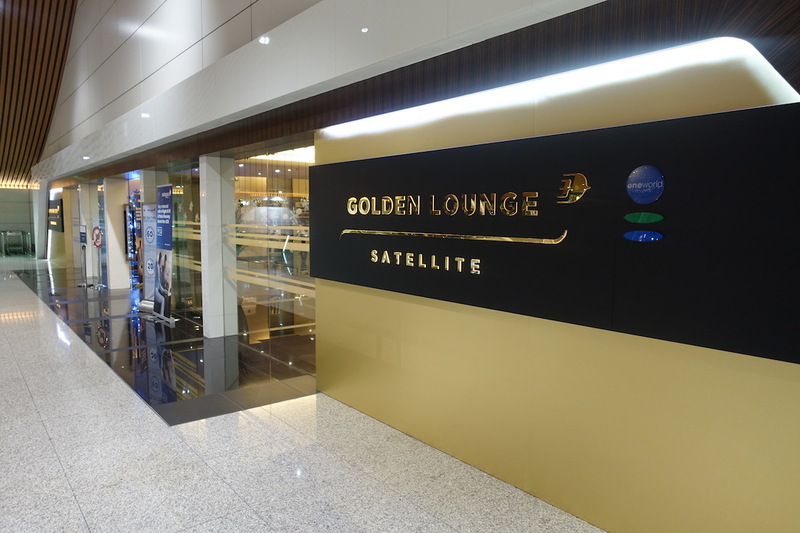 I decided to head to Malaysia Airlines’ Golden Lounge in the satellite terminal, which I knew was open 24/7. 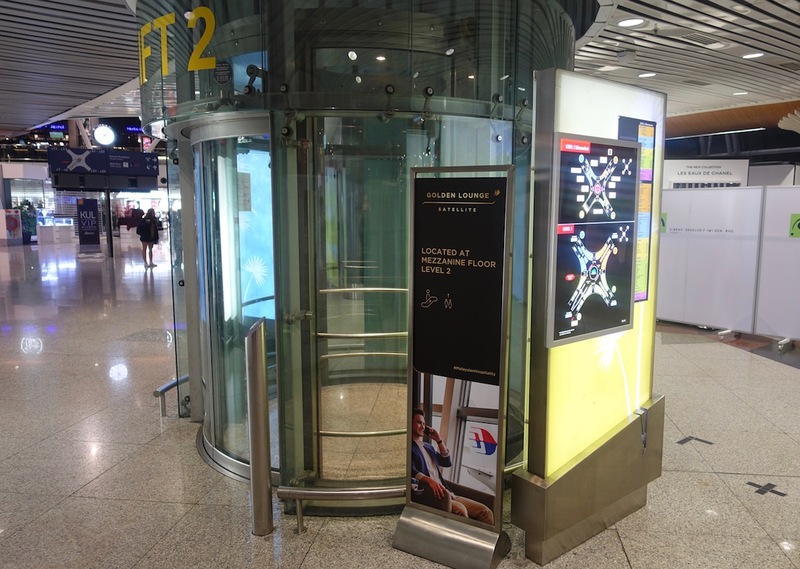 The transit hotel was near gate C5, also in the satellite terminal, so it was only a short walk to the lounge. 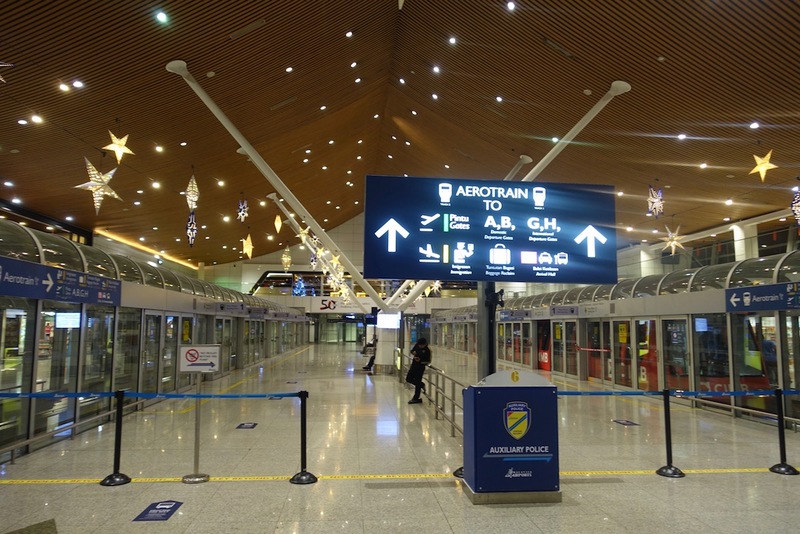 When they pass the train station that connects you to the main terminal, you’ll see elevators on either side that take you up a level. 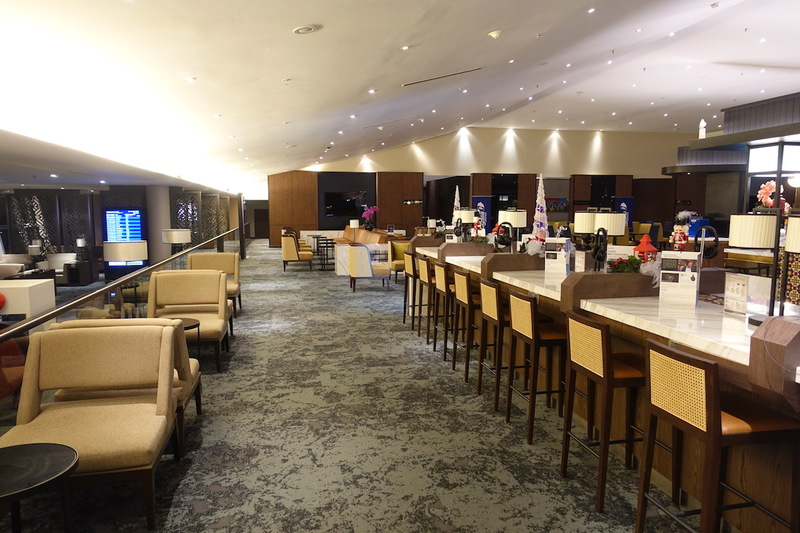 Once on the second floor, Malaysia Airlines’ lounge is located at the far end. Malaysia Airlines only recently renovated this lounge, and I was looking forward to checking it out. 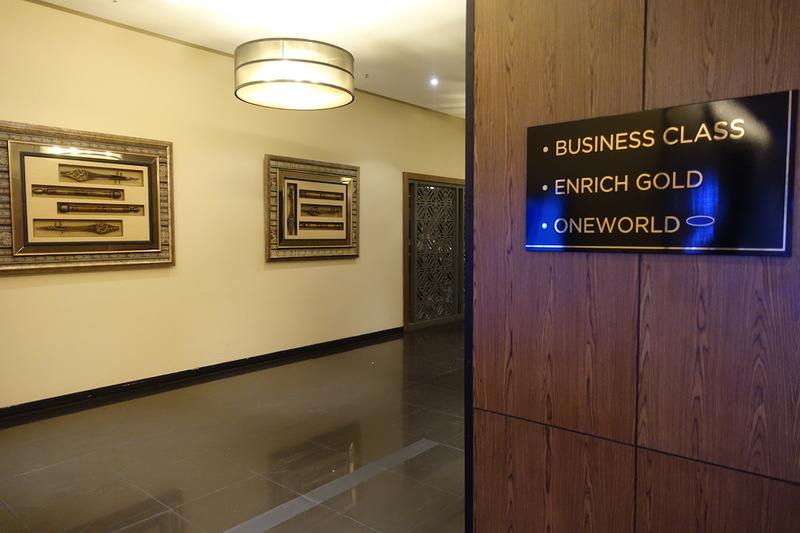 The lounge has two sections — one for business class passengers and oneworld Sapphire members, and one for first/Business Suite passengers, and oneworld Emerald members. I had access to both, but first checked out the former. 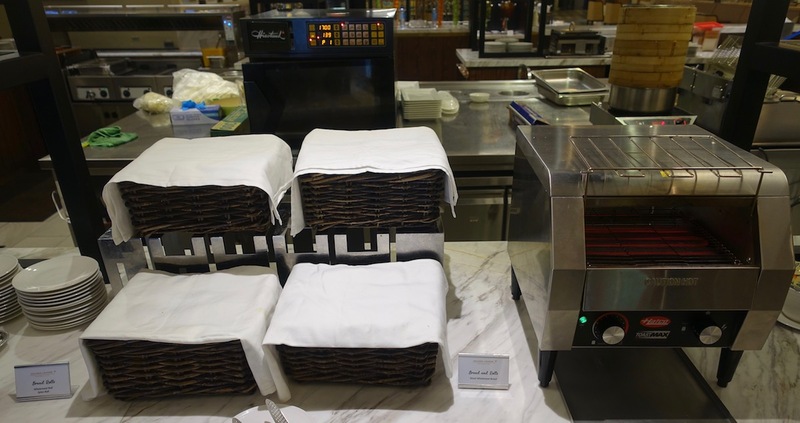 While the lounge is technically open 24/7, it’s not actually properly staffed overnight, and there’s no food. So perhaps more accurately, the lounge is open 24/7, but only if you’re interested in hanging out with their cleaning crew overnight. There was no one at the desk initially, but within a couple of minutes someone showed up and admitted me, even if she was a bit confused by why someone was showing up at this hour. There are four seats near the reception desk. 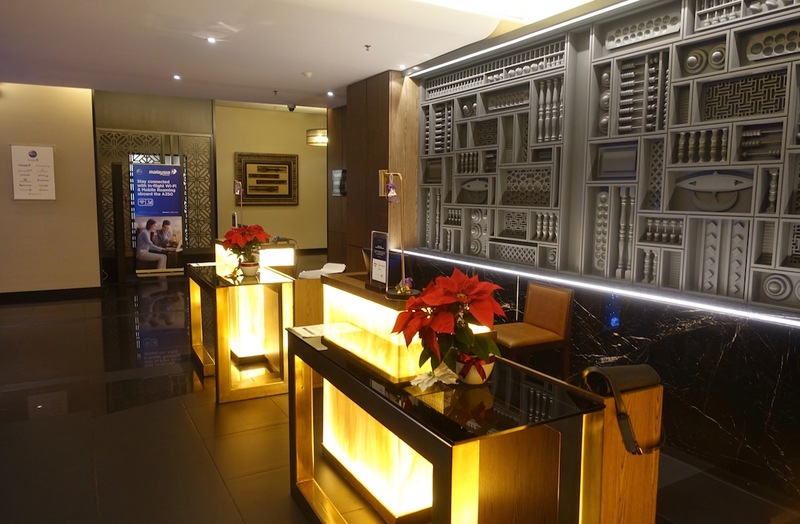 When facing the reception desk, the business class section is to the left, while the first class section is to the right. 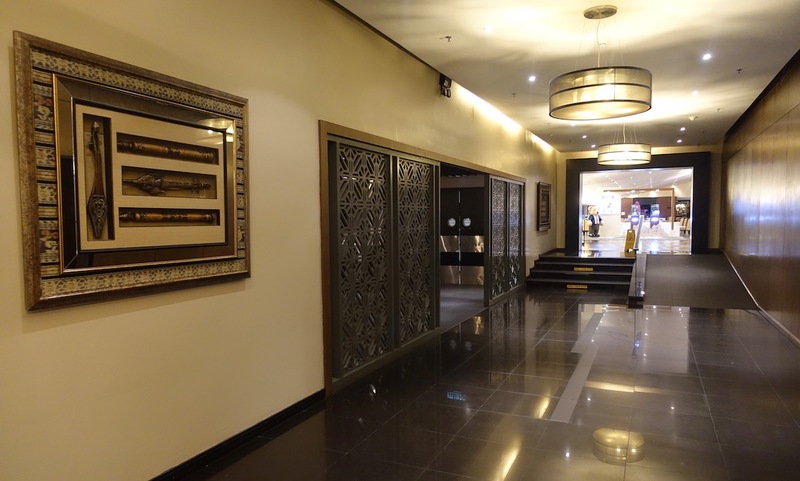 There’s a long hallway leading into the business class lounge. 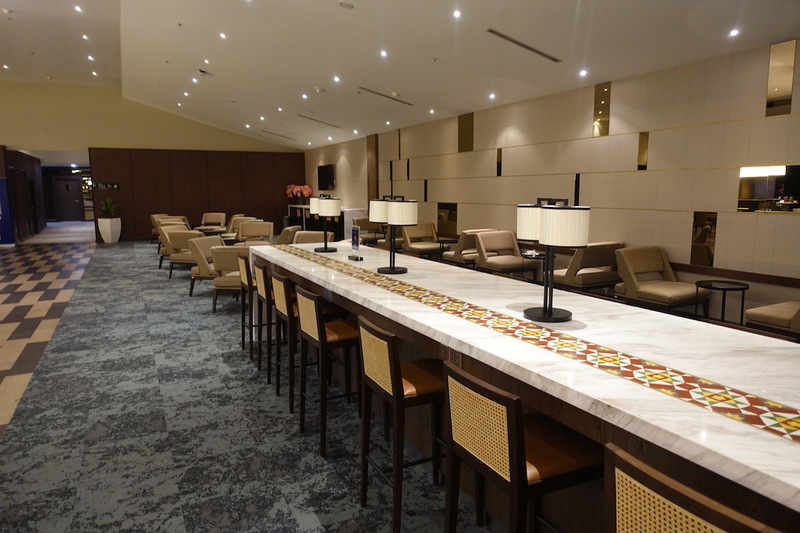 Before you even formally enter the business class lounge, there’s a bar area with high-top seating to the left of the entrance. Then inside the main entrance is one huge room, which is the rest of the lounge. 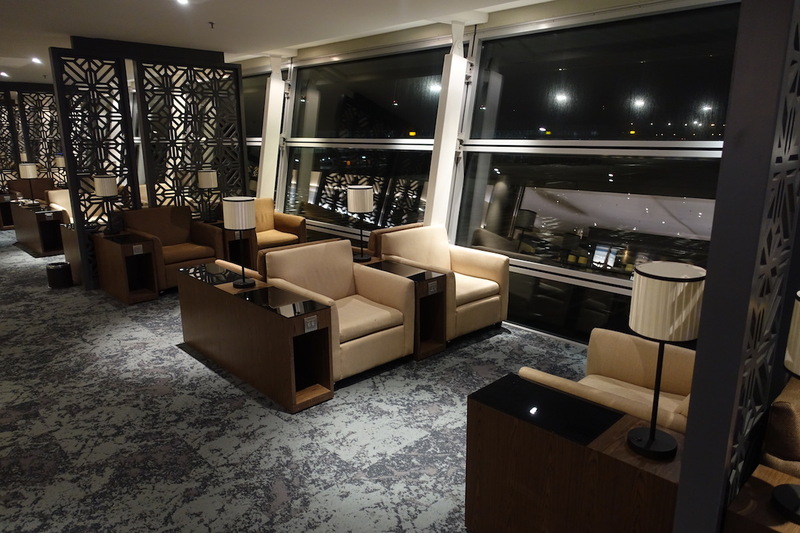 Like I said above, Malaysia Airlines only recently renovated this lounge, and in my opinion they did a spectacular job. This lounge is beautiful. There are a variety of seating options. 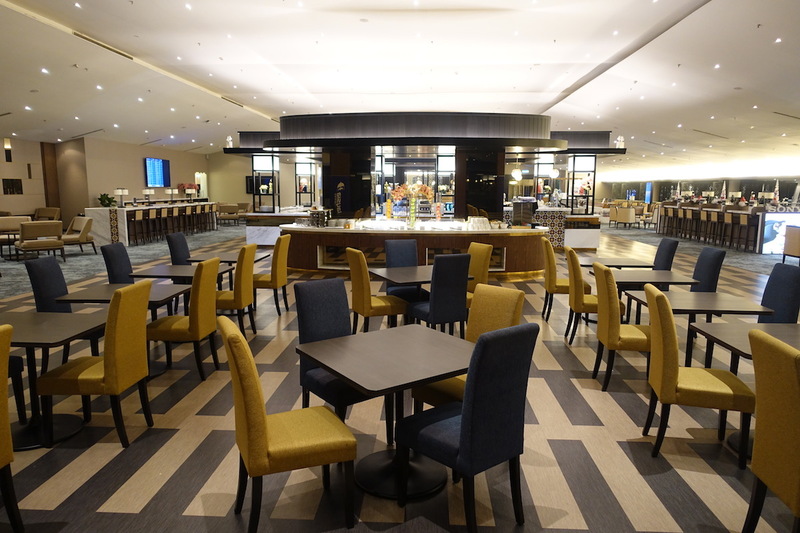 Along the center section of the lounge are some high-top tables, as well as some traditional lounge seating, where seats face one another. 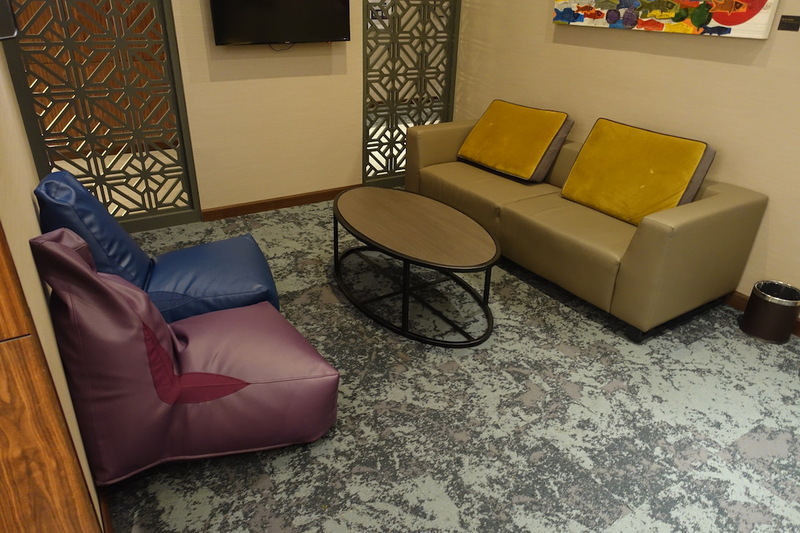 There are also comfortable booths along this area of the lounge. Down a set of stairs is seating by the window, and they nicely use partitions to create more of a sense of privacy between seating areas. Then back towards the center of the lounge are some dining tables. 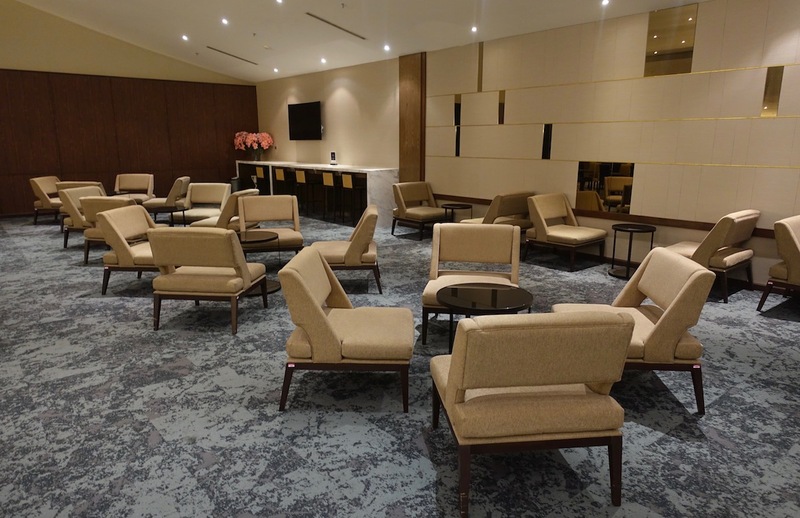 As you work your way further into the interior of the lounge, there are seats arranged in fours, and then more seats by the walls, along with some high-top seating. 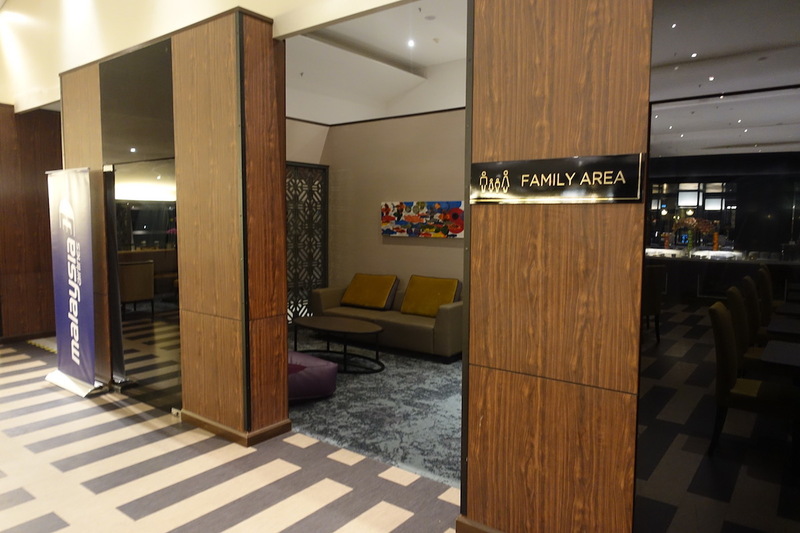 In the back of the lounge is a family area, which is just a partitioned off area with some couches and chairs. Showers and bathrooms are also back there in that part of the lounge. 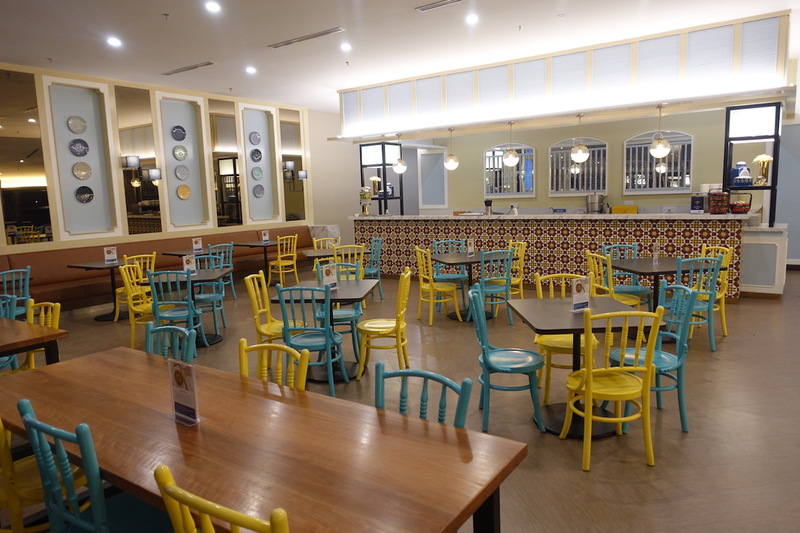 There’s a colorful dining area towards the front of the lounge. 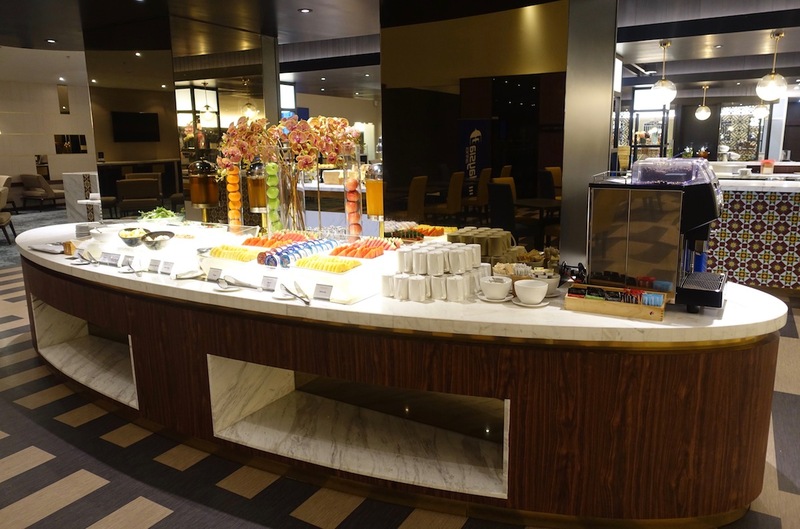 This isn’t a buffet, but rather they have some freshly prepared local dishes you can order. When I visited they were serving laksa johor. 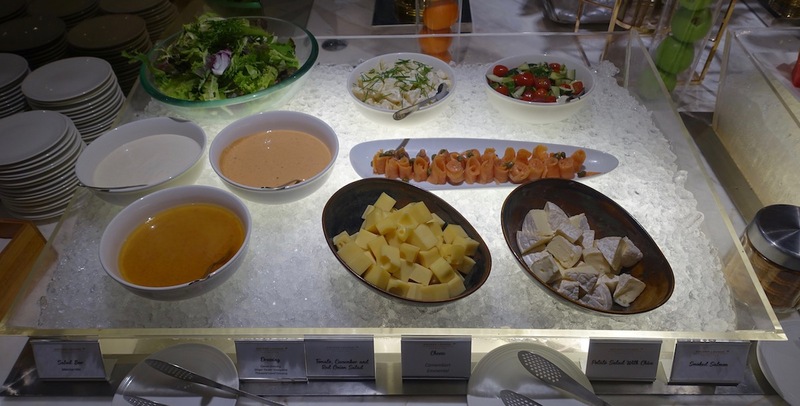 Then in the center of the lounge was the rest of the food selection, which was self serve. Note that this wasn’t available at 3AM, but rather all the food only became available at around 4:30AM, which is when passengers started to arrive (I believe planes were just coming in from Australia). 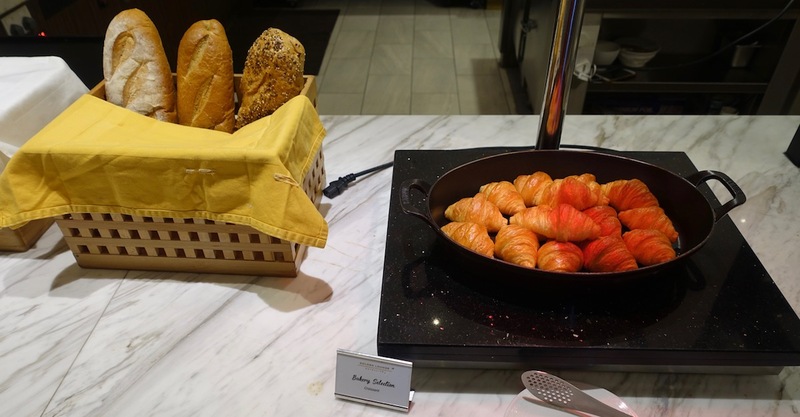 The breakfast selection included fresh fruit, yogurt, salad, croissants, muffins, various types of bread, baked beans, eggs, and several local hot dishes. 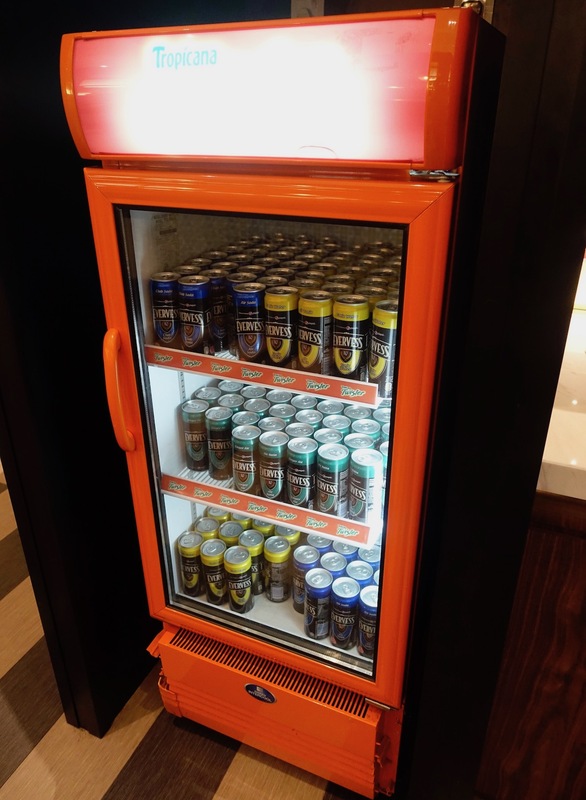 To drink there was juice and then a couple of fridges with beer and soda. I believe other alcohol was only available at the bar. 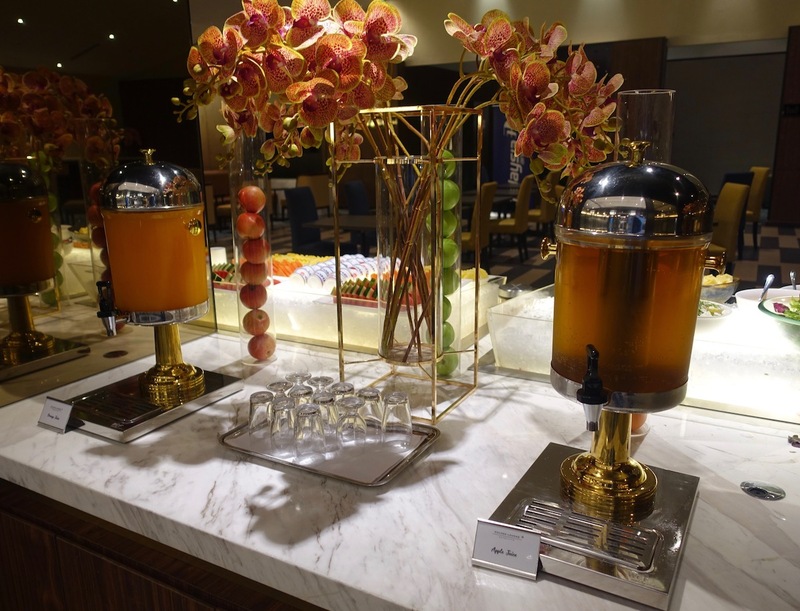 My favorite feature of the lounge was that it had an espresso bar, with custom drinks. I ordered a flat white, which was excellent. I stayed in the lounge until around 5AM, and then headed over to the first class section to see how that compared. 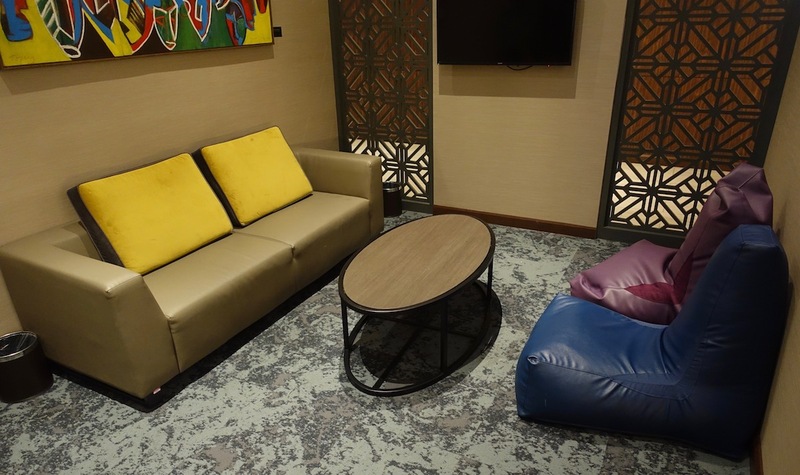 Malaysia Airlines did an excellent job with their new international Golden Lounge. 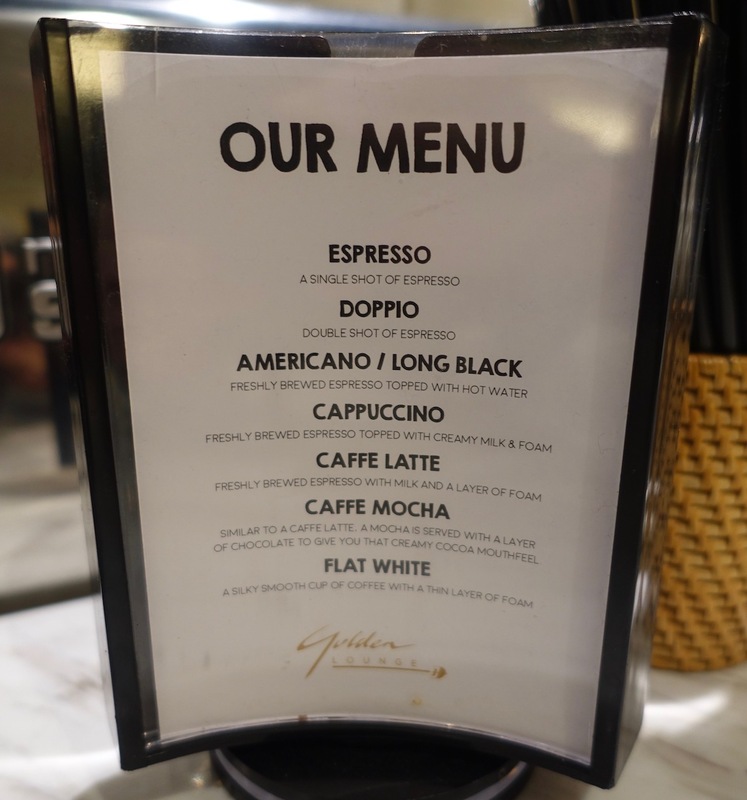 The lounge is beautifully designed, has a good food selection, and I love that they have custom espresso drinks. In many ways the business class section of the lounge is better than the first class section, since they don’t have custom espresso drinks there, and in some ways the food selection in the business class lounge was better. At the same time, I do have to note that I often find Malaysia Airlines to lack basic customer service. The lounge is open 24/7, which to me should mean that they have some sort of service 24/7. I’m fine with them not having food at 3AM and I get very few people use the lounge overnight. However, when I asked for a cup of coffee they told me it wasn’t possible (the self serve machine was being “cleaned,” though I’m not sure why they couldn’t have made me a drink from the barista bar). 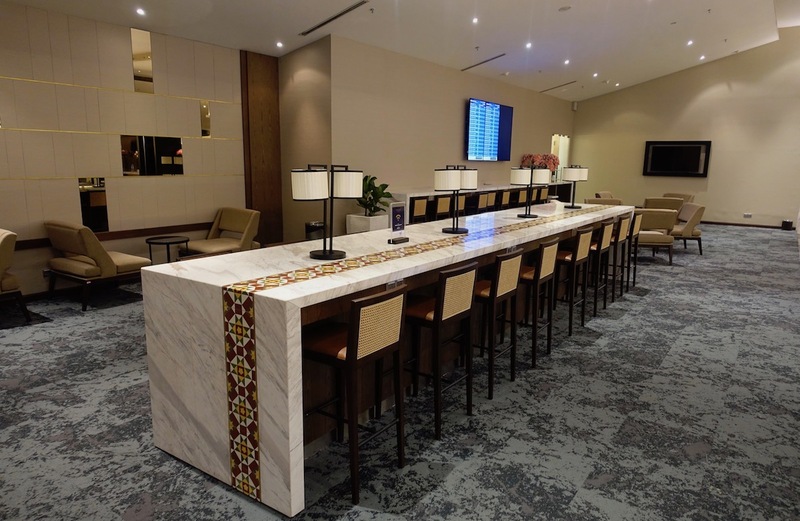 Overall I think Malaysia did an excellent job with this business class lounge. 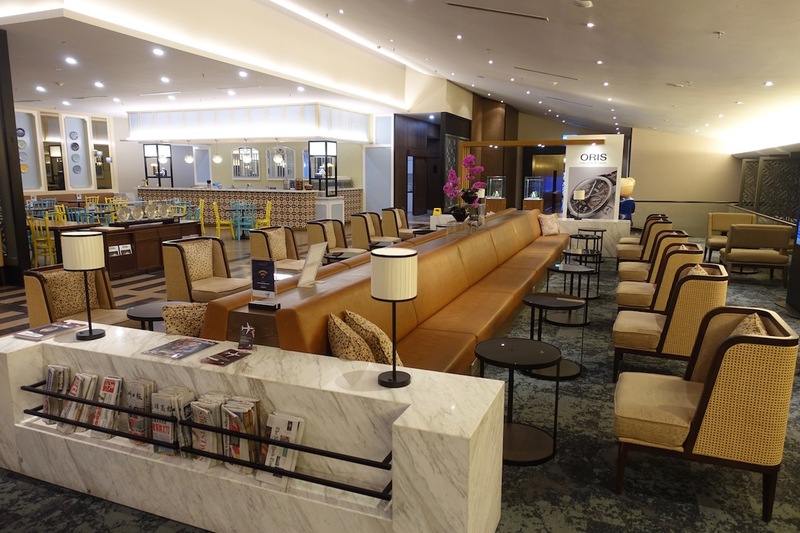 It’s certainly competitive, and to compare it to another lounge in the region, I actually think it’s better than the Singapore Airlines SilverKris Lounge at Changi Airport. 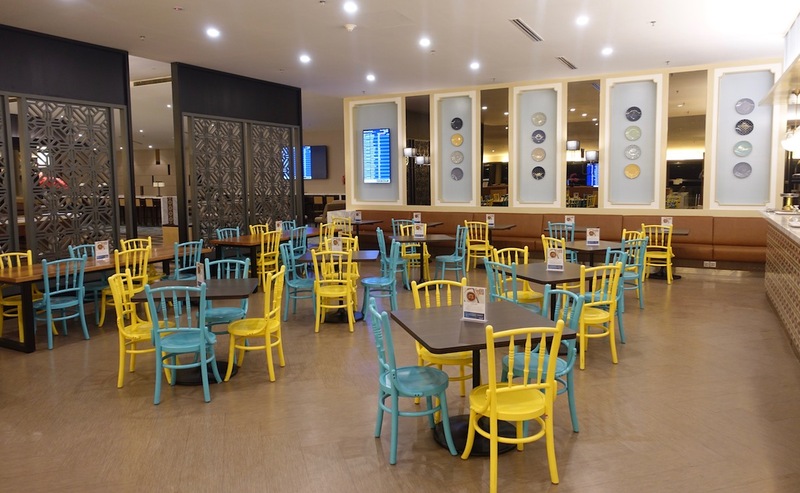 If you’ve visited Malaysia’s KUL lounge, what was your experience like? 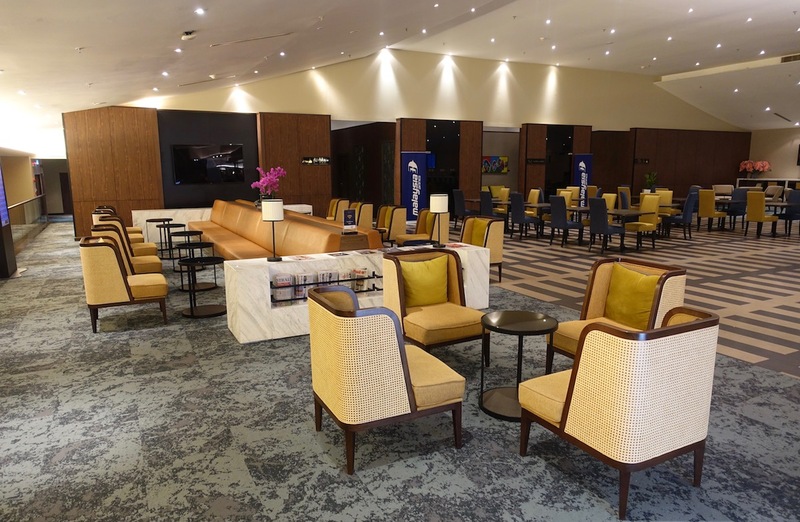 Do you know how the satellite lounge compares to the main lounge? What an opportunity to take pictures without people getting in the way. Really nice. Top of my list next time at KUL. 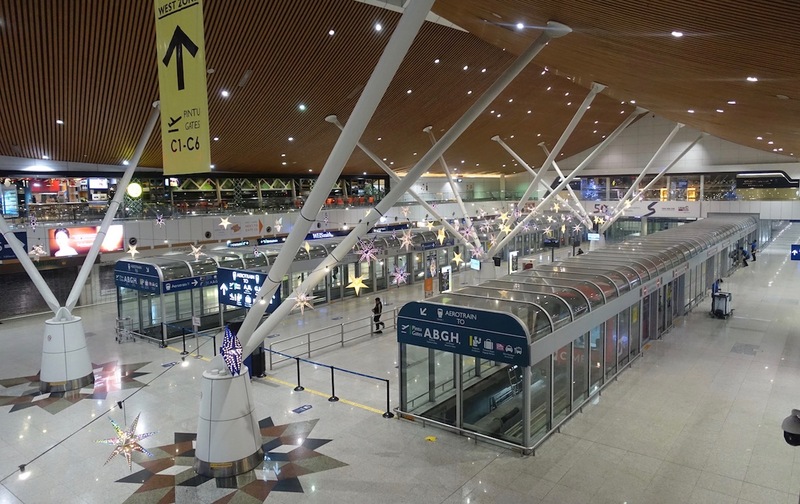 I went through KUL airport twice in January. As a 1st class passenger (always paid ticket) I had access to the private room in the 1st class section but nothing special there. The business class section is better than the first class section IMHO: more room, food and the Airco does not blast like crazy. 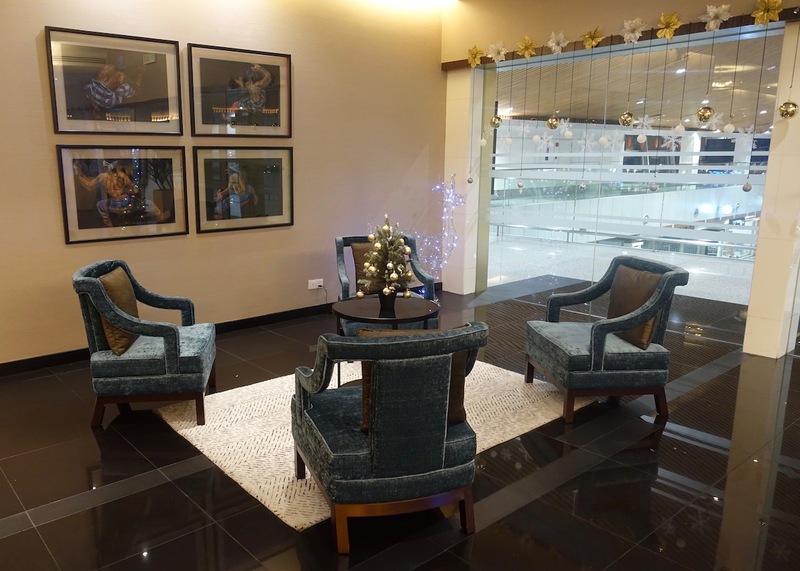 @CC in fact the main terminal Regional MH Business lounge is every bit as good as the Satellite one. In fact I prefer the main terminal lounge as it has everything the satellite ones, and it’s often much quieter with better tarmac views. However the domestic one is appalling thought, give that a miss. @ SK — Hah, indeed. I go out of my way to arrive at lounges early so I can take pictures without people in them. They lack basic customer service because you turned up at 3am and they couldn’t serve coffee? That’s harsh. I’d like to share another experience at this exact same lounge which left me speechless in a good way. I had an overnight transit and decided to sleep in a corner of the lounge instead of the transit hotel. Halfway through my sleep, one of the staff actually came by to offer me a blanket. That’s a level of customer service I’d never expect from any lounge staff! @ Sean b — Happy to hear you had a great experience. No, I wasn’t saying that one example was the only reason the airline lacks customer service, it’s just a general feeling I’ve had with the airline. Their onboard and ground service is highly inconsistent, in my experience. That’s one of the only lounges I’ve ever been to. I love the pink guava juice national drink of Malaysia. There’s a nap area with 6 daybeds you missed. I used it last week. They offered a blanket and a wake up according to my boarding time. 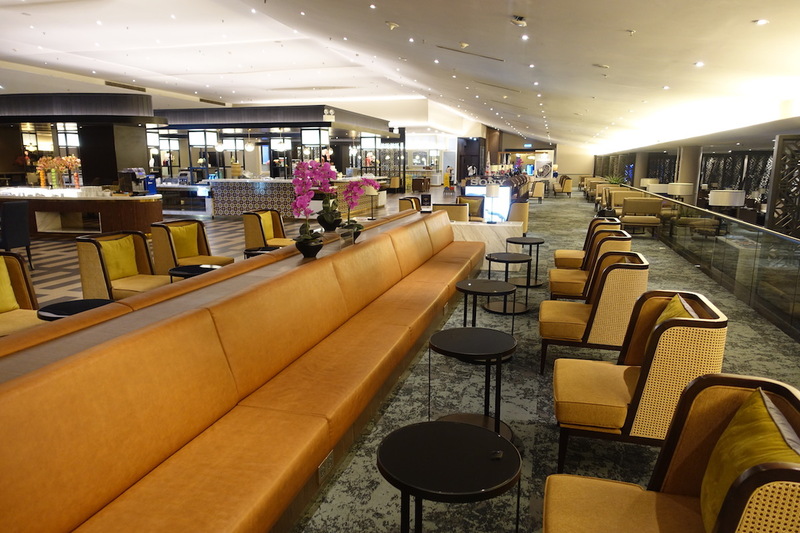 I was at this lounge last summer during a 3 hour connection between BKK and Denpasar. Beautiful experience. I was there during the day and found it to be staffed extremely well. The food was well prepared, hot and with a decent variety of local as well as western dishes. I really enjoyed the coffee and looking out over the tarmac. 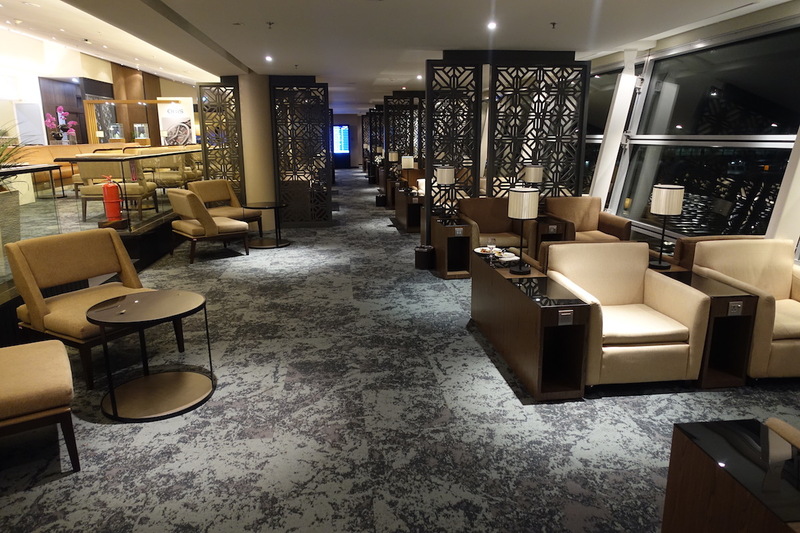 We were in this Malaysia Air lounge in January while we were waiting for a flight from KL to Bangkok. 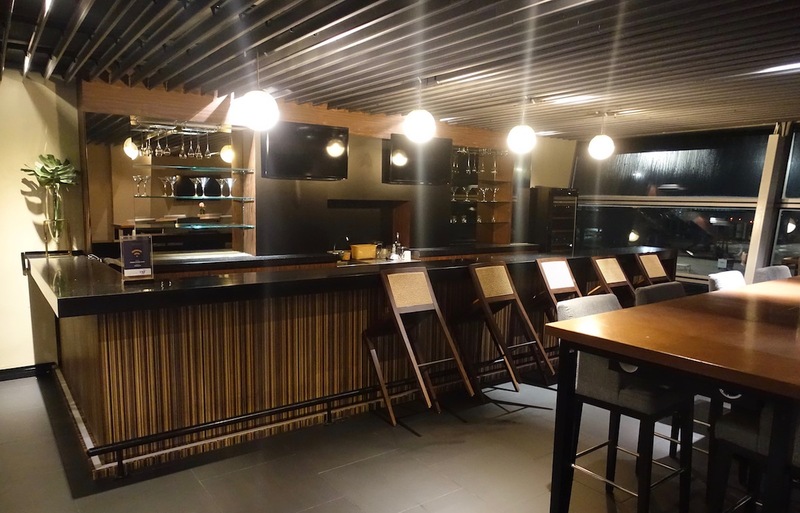 We thought it was a great lounge – food, staff, and furniture were all excellent. 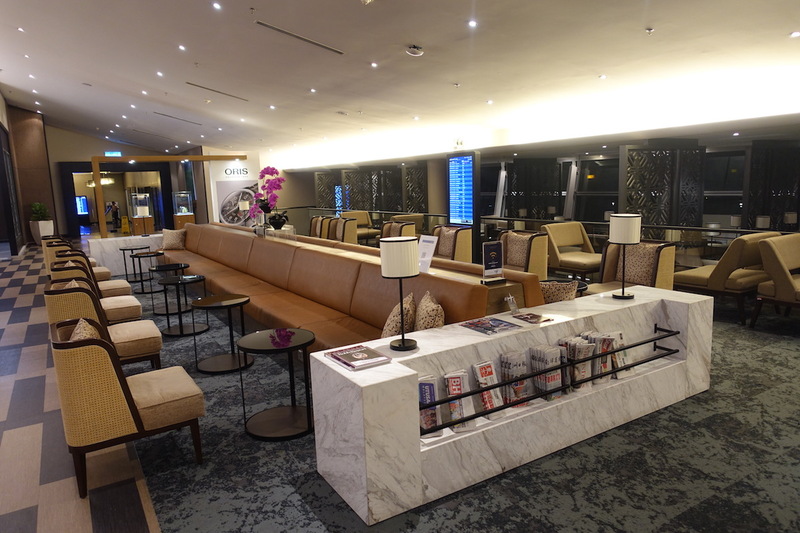 I am about to book business class seats again on Malaysia Air (SIN-KL roundtrip) so we can enjoy the lounge again. Was there in January. Such a nice club! 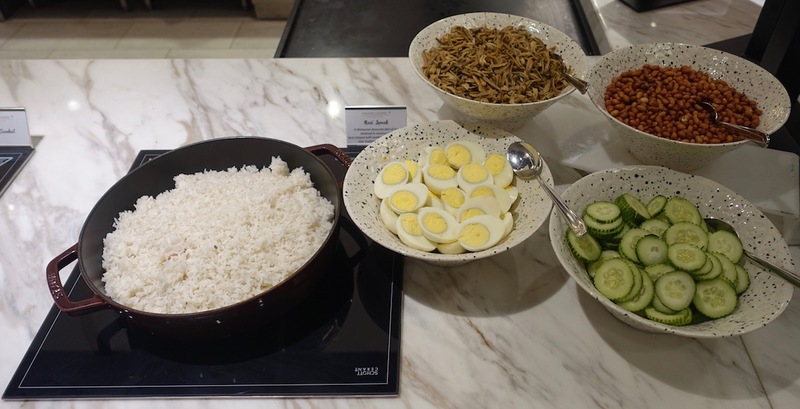 Nasi lemak! The rice + eggs + peanuts + cucumbers + dried fish + other stuff in the picture below mixed together is incredibly delicious! 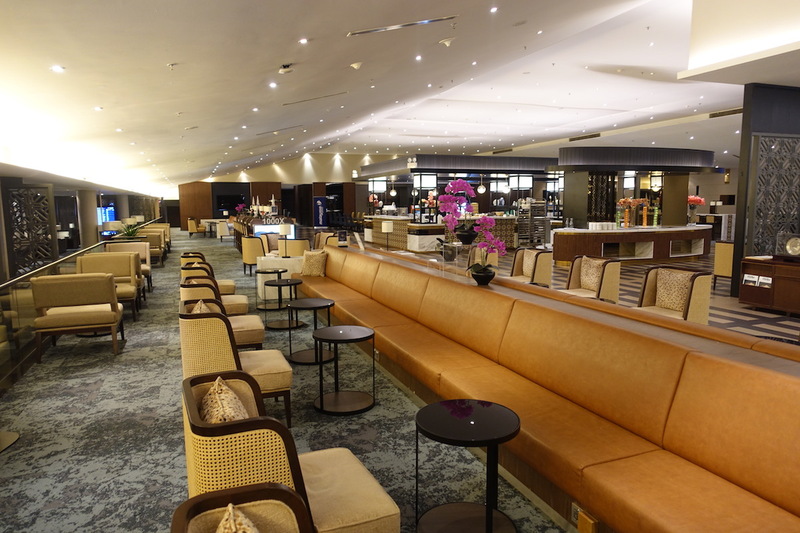 I had it when I visited possibly a different Malaysia Airlines KL lounge, and I’ve been dreaming of it ever since. 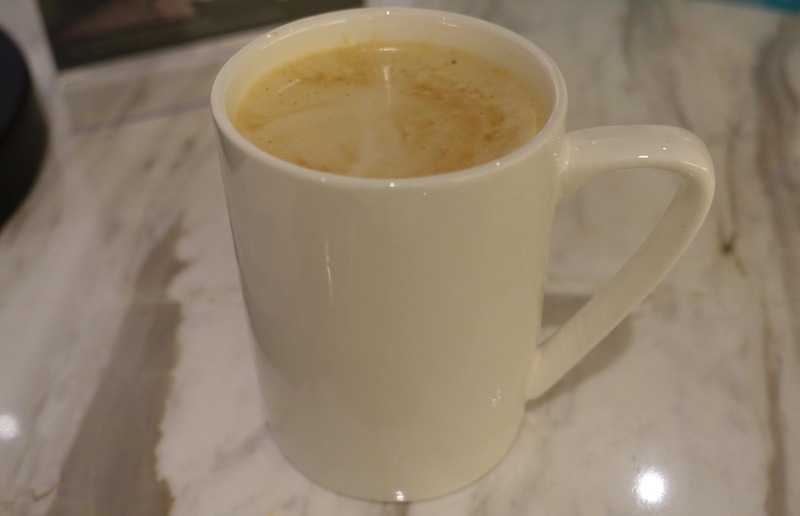 Customized coffee is a plus point for me when it comes to airline lounges! Actually if you visit the lounge in the day, the customer service is pretty awesome. There will constantly be staff members walking around the lounge to assist passengers with any needs. Yes, I agree – This is indeed better than SilverKris lounge in SIN. I’m not sure but my experience wasn’t that positive in this lounge. It’s beautiful, sure. 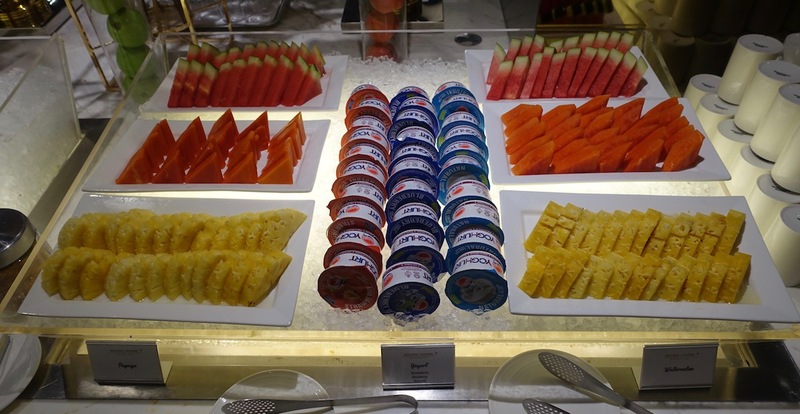 But I found the food selection at dinner to be quite lacking. Laksa Johor was good but the buffet selection was much less than I expected, at least around dinner time. I think there was 1 or 2 hot dishes and the rest were salads and light bites. This was in Jan this year so not sure if things have changed. I was there last summer, arriving on the last flight from KCH and heading out on the first flight to DOH. The food service all stopped at around midnight and it made it rather unpleasant for me as I was still hungry! The lounge was also very busy up until some fo the last major flights left and then my wife and I had space to stretch out and sleep for a bit.